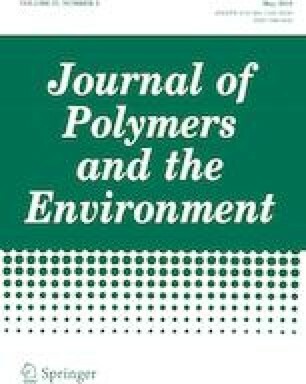 A natural polymeric adsorbent, β-cyclodextrin immobilized starch (CS-βCD) was prepared by introducing host functional molecule β-cyclodextrin (β-CD) onto starch in presence of citric acid. The immobilization conditions were optimized to: m CA:m CS = 1:2, reaction time of 2 h and reaction temperature at 120 °C, by varying the input levels of the reactant, CS-βCD with a series of immobilization ratio (IR) and carboxyl content (CC) could be obtained. The FT-IR and 13C-NMR analysis indicated the β-CD molecules have been immobilized onto starch via the formation of ester linkages. The XRD and SEM analysis showed CS-βCD had more looser structure and more irregular surface compared with native starch. The GPC analysis showed CS-βCD had a reduced molecular weight but a more complicated molecular configuration. The adsorbing capacities of CS-βCD to three cationic dyes (methylene blue, methyl purple and basic fuchsin) were significantly improved compared with native starch, diatomite and zeolite. The adsorption behaviors of CS-βCD to the three dyes had high fitting degrees to both Langmuir and Freundlich models (R2 > 0.98). The decolourization ratio of CS-βCD to the mixed dyestuff waste-water had reached 88.75%, which was much higher than other absorbents. The results indicated the CS-βCD would become a high-efficiency dyestuff adsorbent, and would have a promising application in the industrial dyestuff waste-water treatment. This work was funded by the National Natural Science Foundation of China (No. 51503147), the National Undergraduate Innovation Program (No. 201610058024), the National Modern Agricultural Technology System Special Projects (No. CARS-43-E-2) and the National Key R&D Program of China (No. 2016YFB0303300).